Thousands of slaves attempted to escape but their feats were seldom successful, as many died from tropical diseases such as malaria and yellow fever. The slaves began to attack the oppressive white population with force beginning what Raynal referred to as the ‘impending storm’. They burned down plantations, killed their white rulers, and attacked the towns. The United States was not keen on the idea of a slave revolt because their economy depended on the southern plantations’ crops and production. 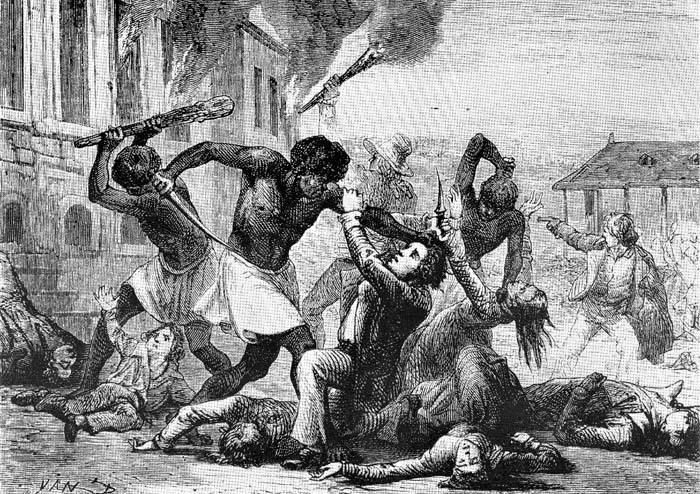 American slave owners were concerned that their slaves would be inspired by the revolt of the Haitian slaves and thus sent aid to suppress the rebellion. The attacks on whites and the destruction of the capital led to the evacuation of many white people to the United States specifically Boston, Philadelphia, and New Orleans. Many also brought their slaves with them. Philadelphia, as well as [Balitmore], is a refuge for distressed allies; the same enthusiastical generosity is there displayed to soothe the misfortunes of the empoverished inhabitants of a lavished isle. … The citizens nobly combined to crush this horrid monster, to efface this stigma from their name, and refused to accede to the knavery: They resolved to suppress it by depriving themselves of necessaries rather than indulge the imposition of unfeeling minds. …—The murderous fury of the insurgents did not afford leisure to preserve the property or clothes: Happy are they who seeing their wealth for ever lost, their friends, their dearest relations fall the hapless victims or more than savage barbarity. Happy were they to elude their unfeeling murderers and escape with life; in this condition they fled their native spot. Wives separated from their husbands lost or murdered; husbands as unhappily situated; children snatched from the devouring flames, and rescued from their parents’ corpse; crowded in vessels, unexpecting any such event, and unprovided with provisions to support the crowd, and flying to the happy shores of America, to which they look up for clothes to cover nakedness, and food to preserve their miserable existence. The summer and autumn of 1793 was exceptionally hot in Philadelphia with temperatures ranging from 75 to 96 degrees. With a population of fifty-five thousand people, it was America’s largest city and busiest port. That summer, in addition to the heat, it was incredibly dry and water levels of streams and wells were low, creating the perfect swarming ground for mosquitos and other insects. The refugees were unknowingly arriving to a perfect set up for one of the deadliest disease epidemics in American history. As the thousands of refugees berthed and stepped foot on the docks of Philadelphia, so did the yellow fever virus pulsing through their veins. The first reported death was Peter Aston on August 19, 1793. Other victims quickly followed, Mrs. Lemaigre on August 20th and Thomas Miller the next day. These deaths were of ‘general discussion’ according to Matthew Carey, an Irish-born American economist and writer who documented the disease in Philadelphia. He also noted that these deaths marked a ‘general terror’ that resulted in the mass evacuation of the city’s citizens to the outskirts of town. Thomas Jefferson and George Washington were among the terrorized evacuees. The people left behind, took refuge indoors. Shops were closed down, hospitals were in deplorable conditions, and nurses were hard to find. With a depleting population, few were left to care for the dead and dying. Doctor Benjamin Rush, a prominent doctor and researcher of the epidemic, believed blacks to be immune to the disease so he reached out to the African Society for volunteers to help nurse the sick. Absalom Jones and Richard Allen, two free black men, volunteered. They, under the direction of Rush, bled hundreds of patients a day, as it was thought that by removing as much of the patient’s blood as possible the disease would leave the body. Unfortunately, this was not the case and patients continued to die and Africans fell victim to the rampant disease as well. 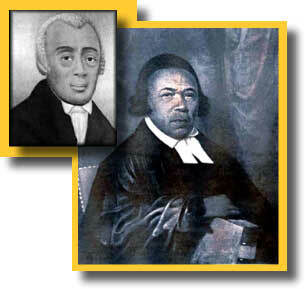 Jones and Allen later published accounts of their experiences in a book called A Narrative of the Proceedings of the Black People During that Late Awful Calamity in Philadelphia in the Year 1793. In their writings, they state that two-thirds of the persons who rendered their services were people of color who were liberated to become nurses at Bush Hill. Bush Hill was a suburban estate built by Alexander Hamilton that was converted into a hospital where victims would be housed and kept separated from the rest of the population. Those still in the city were weary of the indicators of the disease. Symptoms were split into three stages. In the first stage, fever, headache, muscle aches, vomiting, and jaundice occurred. In the second stage, many people went into remission and recovered from their illness, but some entered the third stage, which involves, kidney and liver failure, coma, delirium, seizures, and bleeding disorders. Most who make it to the third stage do not survive. 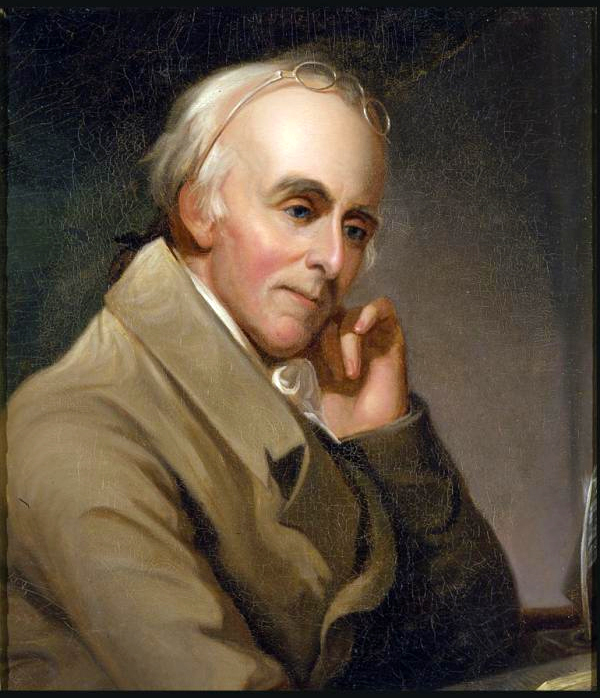 The origins of the disease were unknown but Benjamin Rush had many theories. In his writings about the fever, he hypothesized that the disease had originated from the docks: “these contain a large quantity of filthy matters in a highly concentrated state. They are first acted upon, by the heat of the sun, and hence sailors and the inhabitants of Water fleet, are generally the first persons who are affected by the yellow fever every year. 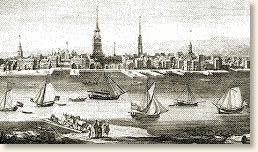 It is derived so frequently from the docks in New York, that it has obtained there, the name of the dock fever.” He goes on to list more possible origins such as the stale air of the ships, dirty sewers, the gutters, and privies, but he never traced it back to the refugees and mosquitos. With no known cause and no cure, the rate of death increased from “ten victims a day in August to one hundred a day in October” according to Samuel Breck, a merchant who later was elected to the U.S. House of Representatives from Pennsylvania. In total, it is estimated that about four thousand people died from the fever in the months of August, September, and October. There was no relief from the deadly epidemic until November, when temperatures dropped into the thirties and snow and rain quenched the city. The pools full of mosquitos froze, killing many of the infected pests. The plague of yellow fever forever changed the city of Philadelphia. The city built better hospitals, isolation hospitals, and more orphanages. People realized the importance of nurse care and doctors and of keeping the city clean. The link between the Saint Domingue refugees and the spread of yellow fever in Philadelphia was unknown at the time and Doctor Rush was quick not to blame specific people for the raging epidemic but today, historians have made the connection clear. “The Yellow Fever Epidemic in Philadelphia, 1793.” Open Collections Program: Contagion,. Harvard University Library, n.d. Web. 12 Apr. 2015. <http://ocp.hul.harvard.edu/contagion/yellowfever.html&gt;. “The United States and the Haitian Revolution, 1791–1804 – 1784–1800 – Milestones – Office of the Historian.” The United States and the Haitian Revolution, 1791–1804. Office of the Historian, n.d. Web. 12 Apr. 2015. <https://history.state.gov/milestones/1784-1800/haitian-rev&gt;. 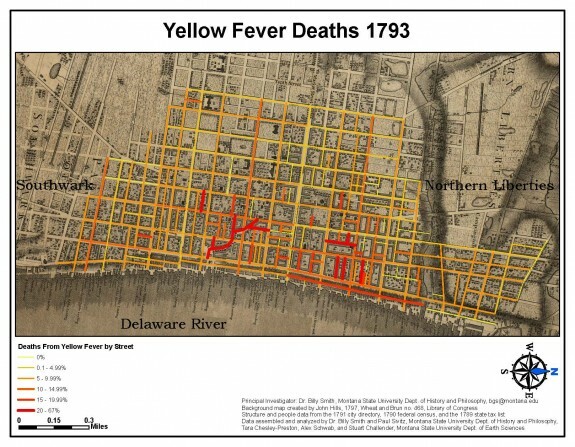 “Yellow Fever Attacks Philadelphia, 1793.” Yellow Fever Attacks Philadelphia, 1793. Ibis Communications, n.d. Web. 12 Apr. 2015. <http://www.eyewitnesstohistory.com/yellowfever.htm&gt;. “Pennsylvania Under Siege: The Yellow Fever of 1793.” The Pennsylvania Center for the Book – Yellow Fever Epidemic of 1793. Penn State University, 2010. Web. 12 Apr. 2015. <http://pabook.libraries.psu.edu/palitmap/YellowFever.html&gt;. Peirce, Charles. A Meteorological Account of the Weather in Philadelphia. Philadelphia: Lindsay & Blakiston, 1847. Google Books. Web. 12 Apr. 2015. <http://books.google.com/books?id=yXkWAAAAYAAJ&pg=PA9&lpg=PA9&dq=temperature+philadelphia+1790&source=web&ots=kDcJ9xhG8H&sig=ocb5JfGI5A8j5ApWfBacyRyY2pY&hl=en&sa=X&oi=book_result&resnum=3&ct=result#v=onepage&q&f=false&gt;.